To stay healthy, your chickens need plenty of ventilation–probably more than they’re getting today. This was discovered over 100 years ago, but has been largely forgotten. Today’s small-flock housing tends to be dank, dark, and smelly. Chickens, like miners’ canaries, are easily harmed by poor air quality. Wet litter breeds disease. Darkness forces chickens, like parrots, to be artificially inactive. “Dank, dark, and smelly” is a deadly combination! A closed chicken house converted to an open-front coop by knocking out the south wall and covering it only with chicken wire. Closed chicken houses are so harmful that knocking out a wall can cause an immediate improvement, even in winter. Chickens, after all, have a thick coat of feathers to keep them warm, but are vulnerable to poor air quality and pathogens in the litter; and their unwillingness to eat in the dark means they can starve in the midst of plenty. Fresh-Air Poultry Houses was written by Dr. Prince T. Woods, a noted poultry health expert. 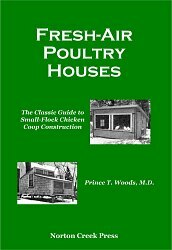 Dr. Woods describes not only his own poultry houses, but those of many of his clients, giving the book a breadth of experience that makes it a unique resource. This 1924 book is old-fashioned and a little eccentric, but in a good way. There are plenty of photographs, plus drawings showing the framing of each house, with construction notes in the text. He does not give the dimensions of every piece of wood, however, or provide lists of materials; you’ll have to figure these out for yourself. But it’s not hard. Knowing what you’re doing and why is the hard part, and this book will tell you that. This book was written before modern materials like plywood or metal roofing, but you will find that this hardly matters. Fresh-Air Poultry Houses tells you what good chicken houses are all about. Any modern introduction to building techniques will bring you up to speed on materials. So by the time you’ve read two books, you’ll have the best of both worlds, and a better knowledge of the whys and wherefores of chicken-house construction than practically anyone who hasn’t been dead for fifty years. Fresh-Air Poultry Houses is a good example of the Norton Creek Press motto: “Most of the best books are out of print and forgotten, but we can fix that!” Check out our other offerings at http://www.nortoncreekpress.com. With pack-horse constancy we keep the road. True to the jingling of our leader’s bells. FOR MANY YEARS it was the custom or common usage of poultry keepers to keep fowls in closed houses. Here and there flocks were kept in the open sheds. The majority of folks were inclined to look upon the farmer whose flocks roosted in the trees, or wherever they could find shelter, as shiftless, careless or even “cruel.” The advocate of fresh-air poultry keeping and open-front houses was considered unduly radical, a crank, or extremist. Reviewing the subject of poultry housing for the past quarter of a century and more, the practice and teachings of early advocates of fresh-air poultry keeping seem far from radical when viewed from a present day standpoint. They were conservative and careful to a marked degree. The development of the modern fresh-air house was a slow process and even today we find evidence of fear of drafts and of unnecessary precautions taken for the “protection” of the fowls housed. If tiny wild birds and feathered game the size of small breeds of domestic poultry can successfully withstand severe northern winters in our woods, with no shelter but trees and brush, why worry about fowls in open-front shelter? Some will say, “but we keep fowls for egg production and for exhibition and must keep them carefully housed to get desired results.” Well, some of the most successful exhibitors now use open-front houses and the experience of many years has proved that condition and egg yield are better in open-front houses than in closed ones, also that the fresh-air flocks are less affected by weather changes. There is nothing to be gained by keeping fowls under unnatural conditions and the closed type of house that may be a sweat-box by day and a refrigerator by night, certainly provides most unnatural conditions for fowls originally intended for open-air life. Brief study of the anatomy and physiology of fowls will demonstrate that they differ considerably in some important particulars from other domestic animals and that they are very dependent upon a generous supply of fresh air for their well-being. Good as fresh air is for men and other mammals, it is even more important and necessary to fowls. The excellent and wonderfully effective breathing apparatus of fowls differs from other domesticated animals. The lungs are comparatively small and have little elasticity. This is compensated for by free communication with large reservoirs or sacs, nine in number. These sacs are independent of each other and freely communicate with the tubular apparatus, with the lungs and with certain bones. The air sacs serve to feed air to the lungs between periods of inspiration. Some oxygenation of the blood may take place through the walls of the sacs as well as in the lungs. The air sacs also serve to diminish the weight of the body and to render equilibrium more stable. Fowls have no sweat glands so that very little moisture is evaporated from the external surface of the body. Very little heat is lost through the skin because of the efficient insulation afforded by the feathers. Also the body is unusually well protected from cold and weather. The kidneys excrete only a very small quantity of water. Nearly all the moisture which escapes from the fowl’s body is passed off through the respiratory apparatus. It should be plain enough to everyone that an abundance of fresh air at all times is necessary to the well-being of fowls—they must have fresh air. They live fast, have a very active respiratory apparatus, breathe rapidly, require much oxygen for the blood to maintain the normal high temperature, and exhale large quantities of carbonic acid (carbon dioxide) and moisture. Much of the dampness in poultry houses, so-called “house sweating,” is due to the moisture exhaled by the fowls which condenses on the roof boards, ceiling and walls. When this “house sweating” is excessive it is a certain indication that there is not sufficient ventilation or the house is crowded beyond its capacity. Damp, stale air, lacking in oxygen and carrying an excessive amount of carbonic acid, is a common starting point of poultry diseases in closed houses. The fowl is starved for oxygen and her natural power of resistance to disease is weakened or broken down. The open-front fresh-air building is a practically dry house as it permits free escape of excess moisture, unless roof boards are too close to roosts when a certain amount of moisture is sure to condense on roof boards above roosts and under some conditions may condense on windows in form of frost. The open-front house gives a full and abundant supply of fresh air, with its contained oxygen, all the time. The fresh air supply is particularly important at night to provide for the heavy demands of the sleeping fowls for life-giving, life-supporting oxygen. Fresh air at night is absolutely necessary to provide for normal restorative processes and the maintenance of body heat during sleep. It has been estimated that fully 60% of the total oxygen needed by the body in the 24 hours is required at night. “When we stop to think of the closed houses that some, yes, the majority of poultrymen have used for their poultry, we should not be surprised that such diseases as roup, diphtheria, cholera, etc., have developed in these closed-house flocks. It is a fact that breeding fowls have been so weakened through insufficient fresh air, particularly at night, that it has been almost impossible to raise their chicks. “The first eight years of my work in the poultry business were with the closed type of house, and I met with very poor results. It was no uncommon thing for me to take hatch after hatch out of my incubators, placing them in the brooder, and in less than three weeks carry them out in pails and bags, losing practically the whole hatch, for those that lived were very poor specimens. Perhaps these poor results cannot be wholly attributed to the manner of housing, yet, from results I have obtained since using my fresh-air houses, I am convinced that most of the trouble was due to close-housing my breeding stock. “My first open-front or fresh-air houses were used during that severe cold winter of 1904 and 1905, and remarkably good results were obtained. Perhaps it will be of interest to you to know what led me to develop my fresh-air poultry house. “During the spring of 1903, Dr. Prince T. Woods, the well known writer and authority on poultry and poultry diseases, visited a number of poultry plants in our section of the country, where at that time very unsatisfactory results were being obtained. Postmortem examinations made on a great many birds of various ages led him to believe that an abundance of fresh air in the poultry houses was practically all that was needed to check the disease and put the stock in better condition. Acting upon his advice, I took the windows out of my poultry houses at once and kept them out until late fall. Seeing a marked change in the health and vigor of my birds, and knowing of the remarkable results being obtained in many sections of the country in the sanitariums that are provided with outdoor sleeping rooms for patients, I felt that in order to get the best results with my breeders I needed to keep the windows wide open all winter. This was the winter of 1903 and 1904. Fig. 7. Tolman Houses in Winter, Author’s Village Experimental Plant-Massachusetts. “Although the three houses that I kept my breeders in were not well adapted to such exposure to the elements in severe winter weather, I obtained fine results, receiving an egg yield during the coldest months, from 150 Light Brahmas, of from 50 to 60 per cent. I was able to hatch from 55 to 65 per cent of the total number of eggs placed in the incubators, and the chickens were large, strong and vigorous. The following spring I had a very small death rate among my chickens. “The three houses with which I made this test were 20×10, (20 ft. long, 10 ft. deep), pitch roof, 5 ft. post, two windows in the south side. During a heavy snow storm, if the wind blew, the floor of the house would be entirely covered with snow, and a large drift in front unless one of the windows was closed. I decided the following fall to try to overcome this defect as much as possible, and I believe with my improved fresh-air house I have controlled the effects of the weather changes as much as it is possible to with a house that is open all the time. Fig. 8. Radical Fresh-Air Methods in 1904. 10×20 closed house on plant of Joseph Tolman, Rockland, Mass. End knocked out and given a southern exposure to provide an open-front. Fig. 7 shows a winter view of two Tolman open-front houses on a village experimental plant formerly owned by the author in the northern part of Essex County, Mass. These houses were built in January, 1906, and used for fowls as soon as built. The measurements as I recall them were 8 ft. wide by 14 ft. deep, 50 inches high in rear and 45 inches in front. A flock of Buff Wyandottes was housed in one and a flock of White Wyandottes in the other. In spite of the fact that the houses were built in mid-winter on frozen ground, in which a pick had to be used to start the post holes, and occupied as soon as built by flocks which had previously been housed in closed buildings, the results were entirely satisfactory, no sickness in either flock and a fine egg yield from the start. The fertility was good, the eggs hatched well and the chicks lived and made splendid specimens. One of the White Wyandotte cockerels hatched from eggs from this flock sold for $50, and was a winner at several local shows in New York state near the Massachusetts line. Fig. 9. Row of Reconstructed Closed-type houses on Tolman plant. Ends knocked out to supply fresh air day and night. Operated successfully several years. Small closed hip-roof house in. background was common type in vicinity. From this the Tolman open-front house was developed by extending the front reach of roof and leaving front of house entirely open. Fig. 8 is a view of one of Mr. Tolman’s closed type 10×20 ft. houses after he had swung it round end to the south and knocked out part of the end to convert it into an “open-front.” The open front is protected by two inch mesh hexagon wire netting only. No curtains of any sort. The roosts are in the north end. It was houses like this, before opening the ends, that Mr. Tolman ran with windows wide open in the winter of 1903, in which the snow from the December storm drifted 3 ft. deep in front of windows and was spread all over the floor and even on the dropping boards. Fig. 9 shows a group of these converted open fronts as operated for several years. Such fresh-air methods were considered radical in 1904 and 1905. The fowls were well protected, more comfortable than in closed houses, enjoyed better health; produced more eggs, gave better fertility and better chicks than the closed house flocks. Selecting the location for a poultry house is a matter to be governed largely by conditions and convenience. In the case of the back-lotter there is very little choice. He has to locate the house where he can and make the most of whatever sunlight he can get. The country place poultry houses are generally located where convenient of access but at the same time not overly conspicuous, for most summer home owners prefer the poultry quarters somewhat hidden from view. The proprietor of a commercial or specialty poultry plant will consider convenience and labor saving first, display for advertising purposes second. The location will in some measure depend upon whether the houses are to be of the colony or of the long continuous type. The man who combines poultry with diversified farming, and has his farm arranged with due regard for rotation of crops, will undoubtedly find the portable type of colony house best suited to his requirements. Such houses permit moving the poultry to new fields, cropping the land run over by the fowls and keeping the soil sweet and productive. This plan generally works out best in the long run. There are a few important things to remember in locating any poultry house. Keep out of hollows where water settles after a heavy rain. Set the house high and dry where both the land drainage and air drainage are good. If locating on a slight slope or side hill, grade the house site level and a little above ground level at rear of house or high part of slope. Provide for drainage of drip from rear slope of roof and of surface water. A southerly slope is usually best. An easterly or westerly slope can be made good use of if necessary, but a sharp slope to the north, or the north side of a steep hill, is not a good location for a poultry building. On some abrupt south hillsides, if care is taken to make back and side walls water tight and provide for drainage of rain and snow water away from house, it is sometimes a good plan to build into the hillside in half-basement style, providing tight rear and side walls of stone and cement. As a general rule the house should face south or a little east of south, so that the interior can be well sunned at all seasons. Whatever house site is selected be sure that drainage of surface water and drip from the eaves is provided. Do not let this water run into the house or under it. Land that will grow fruit trees and good grass, light loam with gravelly subsoil, is preferable for poultry runs and can be used to good advantage by alternating poultry and crops or for poultry and fruit at the same time. Frequent stirring and cropping of the soil helps to keep it sweet and in good condition for poultry runs. Heavy land is not so desirable. Sandy, rocky and barren gravelly soils will serve, if necessary, but I would not choose such for best results. Wet land along running fresh water can be used to advantage for poultry if houses are placed high and dry, but stagnant swamp land is not desirable. If the latter must be used, clear up and drain it first. Salt water marsh makes an excellent poultry run, particularly for free range flocks, if houses are located on dry upland. With good housing, good food and reasonably good care poultry can be made to do well almost anywhere. My own preference is for colony poultry houses, either permanently located or of portable type. I find them more convenient and there is less risk than where, all the fowls are kept under one roof in a long house. Fig. 10. Two Woods’ Open-front Houses on plant of J. W. Parks, Altoona, Pa. These are used for hard coal brooder stoves in chick season and for housing stock when it reaches roosting age. There are many poultrymen who prefer a long poultry house. Certain open-front houses are adaptable to the long or continuous type of poultry house, others are not. The one time popular long house with walk or alley in rear is convenient in some ways and undesirable in others. It is expensive to build. Where a long house is used, I consider it better to do away with the walk or alley and provide for pen to pen communication through house by doors which swing both ways, located about midway between back and front. Passing through the pens is inconvenient in some ways but it possesses the advantage of bringing the attendant in close contact with the flocks which outweighs any possible disadvantages. To get best results it is necessary to keep in close touch with the birds. I like small colony houses which can be readily moved about the farm to new locations when desired. There are a number of good portable houses which answer the purpose. Large colony houses should be permanently located and may be arranged in convenient groups. Provision should be made for double yards where possible so that soil can be kept sweet by alternating poultry and crops.The colony house, which can be used for brooder operation in chicken time, then brooders removed and growing chicks given roosts, later on weeding out and culling flock to leave only the better pullets in the house for fall and winter egg production, provides for year ’round poultry quarters which are very convenient and which possess the considerable advantage of avoiding the troublesome moving about of early pullets, first from brooder or brood coop to growing house and later to laying house. With many growers there are fewer setbacks where chicks spend their first fall and winter in the colony house where they were brooded. I am enclosing you a couple of prints I had taken lately of two of my Woods type houses. I am very well pleased with them and they are especially adapted for keeping hard coal brooder stoves in. Putting roosts in and culling the chicks out from time to time, we get use of the houses the whole year around. Fig. 10 is view of these Woods houses and chicken runs on the J. W. Parks plant. Houses intended for small and growing chickens must have rat tight floors of either concrete or wood. It is not safe to use earth floors. Portable colony houses for adult fowls may be set on a movable foundation of stone, brick, or wooden blocks and earth under house—used as floor, filling in a little where necessary or using boards to close space between sills and ground. Providing a clean floor is simply a matter of moving the house to a new site. For permanent poultry houses, although I have used such for many years, I consider earth floors the least desirable and most expensive in the long run. Earth floors foul to a considerable depth. It is advisable when such are used to take out the top earth to a depth of at least a foot, or better 18 inches, and refill with fresh earth at least once every year. This is a considerable job and calls for a good deal of labor expense. Too often it is such a nuisance that the work is neglected and the houses are not cleaned out as frequently as they should be. Tight board floors are excellent if kept clean and made mite proof. In some portable houses I have used a single matched board floor made in sections so that it can be easily removed. For permanent houses a double board floor, well timbered to make it solid, is preferable. Use rough boards snugly laid on floor timbers for first floor. On top of this use smooth matched boards laid at right angles to first course. A layer of asphalt-such as is used for making old roofs water tight, the kind that dries out hard but elastic, about one-quarter of an inch thick will make the floor mite proof and less likely to be gnawed by rats. Crude creosote, or common brown creosote shingle stain, painted on floor boards once a year will make the floor mite proof if asphalt is not desired. Or if neither asphalt nor creosote is desired, sweep clean the board floor and then soak it down with hot whitewash or Carbola disinfecting water-paint applied with a sprayer early in May each year. Select a good warm drying day for the job. Concrete makes an excellent floor for a permanent poultry building and the directions which follow are quoted from New England Homestead. As a rule the top of the concrete floor should be flush with the top of sills. This calls for putting in the floor after foundation walls and sills are laid. It takes a little skill to make a good concrete floor. The sand should be sharp bank sand, the gravel and stones should be clean-free from clay and loam—and well assorted as to size so as to fit in well. The whole must be well mixed and thoroughly tamped into place before it begins to set. Fig. 11. Section view of foundation trench, sub-base of field stone (S), frame boards for supporting; concrete wall (F,F), concrete wall (C,C), anchor bolt for sill (B), G,G, is ground level. After concrete has set, frame boards are removed and trench filled in with earth. Fig. 12. Section view of concrete foundation wall, concrete floor and sub-base of stone, coarse gravel or cinders. 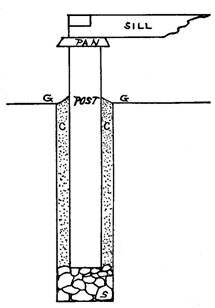 Sill and anchor bolt (B), ground level (G). For a poultry house foundation where a concrete floor is to be laid it is preferable to first make wall on which sills are to rest. Locate house corners and mark them with stakes to which corner boards are fixed at right angles to make corners. With marking line -white fish line will serve—lay out course of sills between corners. Make a good job of it. Along this line of sills dig a trench below frost line, or about 3 ft. deep. For convenience this trench should be about a foot wide. Fill in to within about twelve inches of ground level with large and small stones and coarse gravel or coarse cinders. Above this sub-base the concrete foundation walls should be laid with aid of wood frames 18 inches wide and about 10 ft. long for convenience in handling; should be set firmly in place on sub-base along sill line around entire foundation where wall is to be laid, frames parallel and about six inches apart on inside. Nail corners securely and cleat frames together every three feet to prevent bulging when cement is poured in. The top of frame which is to be top of foundation Wall, should be about six inches above ground level. One part of cement to 4 parts of good clean gravel-well assorted as to size and containing some sharp sand-makes a good foundation mixture. Fill in the frames with concrete and level off at top of frame. While filling in the concrete set anchor bolts at corners and ten feet apart upright along the sill line. These bolts should be about 8 inches long and end carrying loose nut should extend about three inches above top of concrete. Sills of 2×4 material laid 4 inch side up are sufficiently heavy for use on a concrete foundation. Bore these at proper intervals to receive the bolts. Use a flat washer between sill and nut of bolt to protect sill. Sills should be bolted firmly in place after concrete has hardened. It takes three or four days for concrete to harden sufficiently so that frames may be removed. Sills should be laid flush with outside edge of wall. The frames can be used for laying walls of other houses. It is important to take sufficient time and use care in laying foundation walls and in filling same in with concrete floor. Under ordinary weather conditions the foundation walls will need to season for about two weeks before building begins. Unless walls are well seasoned the weight of house will not be sustained. In hot weather it is well to keep concrete shaded from sun with boards until it is well set. Fig. 13. 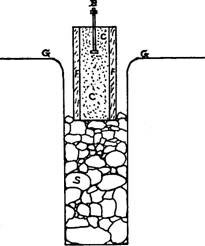 Section view of wood post set in concrete (C,C), with sub-base or drain of field stone (S). Ground level (G,G). Inverted pan on top of post is to keep rats from working through the floor. Sill joint is shown at house corner. If a concrete floor is laid with a slight grade, sufficient to run off water, high at rear of house and low in front, and near front graded from sides to center to end at a tile drain covered with a drain cap, it will prove a great convenience. The house can then be washed out with a hose whenever desired. For such a grading job it will be better to call in an expert in concrete work. It is a difficult undertaking for a novice. The level concrete floor can be washed if necessary with pail and mop, or with a sprayer, and then bailed out with scoop and mop, but a well built drain is a great labor saver. Concrete posts, provided with anchor bolts of sufficient length to take sills, may be used for houses with wood floors. Make them in frames about 6×8 inches inside measure and set into ground about three feet extending above ground about one foot. Use same mixture and same plan as for wall foundation, except that post holes are dug along sill line about 10 ft. apart to centers. Make them wide enough to work in conveniently. For such houses use a 4×4 or 4×6 sill and have anchor bolts extend far enough above concrete to engage same properly. Use level and line to make sure that tops of posts are on a level, so that when sills, are placed the foundation will be level. Let frames for posts remain in place for a week. Do not start house building until posts have seasoned for fifteen days or more. Sills to be laid in concrete or cement should be given one or more coats of wood-preserving creosote or asphaltum, and same allowed to dry in thoroughly before the sills are laid. Houses with wood floors should have sills fully 12 inches above ground level, and may be placed higher, so that with aid of good dog it is possible to keep space below house free from rats. Red cedar and locust posts, well seasoned, make the best and mostlasting wood posts for house foundation. Wood posts are easily placed and ready to use as soon as set. Post holes for same can be quickly made with a post hole digger. Red cedar posts, in holes three feet deep, hole filled in with a concrete mixture of one part cement, three parts sharp sand and four parts coarse gravel, small stones or cinders, and top of concrete rounded off a little above ground level, will last almost indefinitely. Seasoned oak posts will serve if cedar or locust cannot be had, but do not last so long. Chestnut also makes a good post. In preparing for a post foundation, lay out the corners with stakes and guide boards at right angles and make the sill line with cord in same manner as when preparing to dig trench for concrete foundation wall. Level tops of wood posts so that sills are on a level and spike sills to posts. Fig. 11 shows section view of foundation and concrete wall as laid; G,G, ground level; F,F, frame boards for retaining concrete wall until set hard; C,C, concrete foundation wall; B, anchor bolt; S, stone sub-base. Fig. 12 shows section view of foundation wall with sill and concrete floor; G, ground level. Fig. 13 shows cedar post set in concrete with a sub-base of stone. The pan on top of the post is to keep rats from working though the floor. Sill as fitted at house corner is shown. G,G, ground level; C,C, concrete filled in around post and rounded off above ground level; S, stone base which helps to keep post dry; B, anchor bolt. If I were to build again and could have my choice of materials, I should frame my poultry house with comparatively light material and enclose it with a single wall of red cedar matched or novelty siding only. Roof either of same material or of smooth boards covered with asbestos shingles. Heavy walled or double walled poultry houses art not necessary. I believe that a house of material named would cost less in the end, prove comfortable at all times and require but little time to build. Usually in poultry house building one has to use such material as he can get cheaply, often second hand lumber. Spruce makes excellent framing material, but whatever framing is available can be made to serve. For sills on concrete foundation 2x4s are ample, on a post foundation use 4x4s or 4x6s. Studs 2x3s. Plates 2x3s. Rafters and floor timbers 2x4s as a rule. Small houses do well with a 2×3 rafter. Houses where floor span is considerable and where heavy-weights use the house, 2x6s or 2x8s may make better floor timbers. Where house is to be shingled or covered with roofing fabric any good covering-in boards will serve if fairly smooth on side that goes inside house. To avoid having mites accumulate between shingles and covering-in boards dip shingles in creosote shingle stain before laying. It can be had in three colors, brown, green and red. Second quality shingles are good enough for side walls, but it Joes not pay to put anything but 1st extra clears on roofs. Roofing fabric will last indefinitely if given a coat of asphaltum every year or two. If not so treated, there is no roofing that I have ever used that will last over ten years. Window sashes can be bought ready made and glazed and should be painted before putting in. Window casings are usually cheaper to buy ready made to fit windows than to make. Door frames I have always made of white pine and doors of matched pine, door cleats put on with screws. So made and the door kept painted there will be very little if any swelling or warping. There will be more about building materials and construction as we go into details of plans for several good types of fresh-air houses. Buy Fresh-Air Poultry Houses today!